How is writing for video games similar to writing for comics? Marv Wolfman is a comics legend for his work on Teen Titans, Superman and many others. For a half-dozen years, he's been writing for video games, and he explains how both kinds of writing are about characters more than plot. I've played games since the first coin machine version of Pong. Like most I wasted an unGodly number of quarters losing at PacMan, Popeye, Donkey Kong and the rest. Later, I owned a Colecovision. Moved onto PC-games. Stopped for awhile because games got to be the same (nobody improved significantly on either Doom or Wolfenstein) then got back into it when they started to be different again. I currently own a PS2, PS3, X-Box 360 and a Wii. I no longer play games on my PC (Mac!) because I don't want to game where I work. I want to physically go elsewhere rather than still sit at my desk. But for the longest time I never thought about getting into the business of writing games, partially because for the longest time they weren't quite written. There were some brilliant games coming out (Myst, 7th Guest, etc.) but most writing was in-house and done by those producing, designing and programming the games. Only in the last number of years, when story started to be more important in many games have outside writers been brought in to structure complicated concepts, develop interesting characters that people might want to see again and again, and write dialog that draws you further into the gaming experience. There are still games that don't require that kind of writing. And in many cases writers simply aren't needed to supply either structure or dialog, but as some games become story and character driven, it's been proven that a good writer can make the difference. My job has always been to make characters who are interesting and turn them into what today we call franchises. Whether I'm creating a comic such as New Teen Titans where I have to come up with dozens and dozens of new characters and concepts, or if I take over an old, established title such as Superman, where I helped recreate both Brainiac and Luthor and introduced Cat Grant and many others, my job is not only to write interesting stories, but to make the characters themselves worth following. There are only so many plots and concepts out there but there are as many character concepts as there are people in the universe. We are all hard-wired to love to follow the stories of interesting people, and that's the real job of the writer, no matter what medium he or she is working in. But how do you do that in games where the player is in charge? I believe it's in the way you structure your story and make it come out of character. It's in the way the characters react. It's in the dialog that makes them interesting. When I'm brought into the game writing process early enough, sometimes before the game is even worked out, I try to influence the story by having it important to the characters in the game. If the characters feel what is happening is not only important but vital to themselves, then that enthusiasm will be transferred to the player. The player won't be going through just a series of fights or puzzles, but through something that is important and meaningful. It's slight of hand, smoke and mirrors, but that's what story-telling is all about. We create a situation that is unreal and make you care about it using every trick we can. Beyond writing games I'm sometimes brought in to help companies restructure their games, to find a way to make their stories, beyond great game play, dramatic and compelling. I refocus the stories and try to make the dialog important rather than purely informational. How many games do you come across where the characters just tell you something? Where the dialog is bland exposition rather than interesting and snappy. I believe it doesn't take much to turn it all around and make the dialog as compelling as the game play. Games are first and foremost about the game play. A writer can't forget that though sadly all too often they do. They want linear construction to take over. But games are not about that. Our job is to enhance the game play, not control it. Maybe it's working in comics all my life where I virtually work side by side with the artist, but writing games, like comics, is a collaborative medium. If a writer wants to control everything, write a novel. If you want to work in games, you have to work with many, many others who actually make the game work. But when a writer works hand in hand with the producers and developers, then you have the possibility of getting a great game where play and story are completely intertwined. 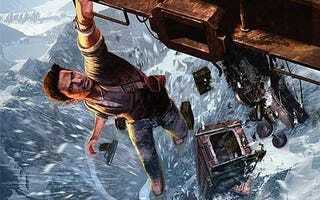 Many games do that these days, games such as Uncharted 1 & 2 for example, which immediately pop into mind. Wonderful game play where the story and dialog and play mesh completely. I think as games continue to mature as a medium, story, character and play will keep getting stronger and stronger. Least I hope so. I love writing games and I can't wait for tomorrow's panel to discuss the process and learn more from the other writers as well. This post by Marv Wolfman originally appeared at his blog. He'll be appearing tomorrow with writers Gary Drucker, Sean Jablonski, F.J. Lennon and Susan O'Connor at the Writer's Guild West to discuss writing video games.